We finally have real winter weather. Snow! Cold! Wind! Needless to say it feels good to be inside a warm cozy house this morning with the outside temperature at 23 degrees. Daughter Lovina, 14, just left for school. Son Benjamin left for his job at the RV factory around 4:30 a.m. and the rest of the family is at home. My husband Joe will return to work on Monday, January 14, after being off work for three weeks. Kevin after surgery on his left foot. Yesterday we spent the day at C.S. Mott’s Children’s Hospital in Ann Arbor. 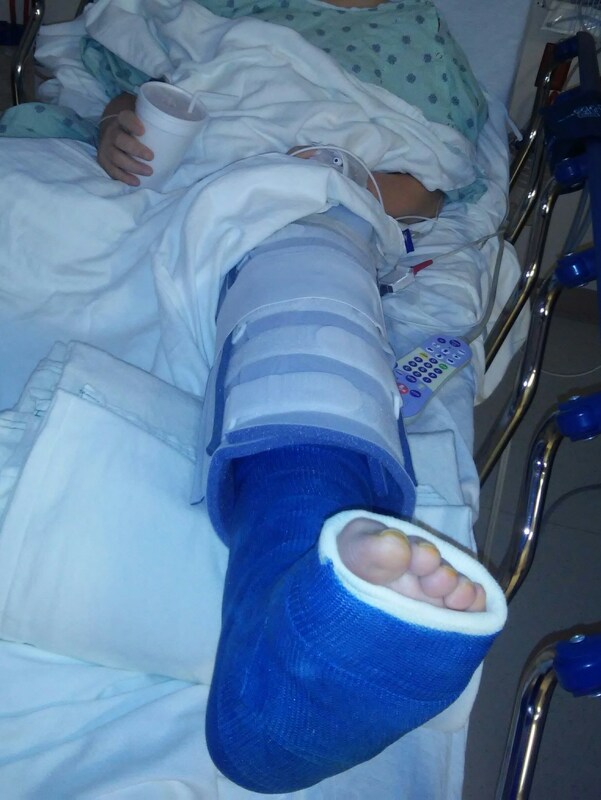 Son Kevin, 13, had surgery (heel lengthening due to his muscular dystrophy) on his left foot. His foot and leg are in a cast up to his knee. Once again we are thankful for the great work of Dr. Caird and staff. She is such a great person! We thank God for His protecting hand. Now we hope God grants Kevin the patience to endure the recovery time. He will be in this cast for six to eight weeks and is not allowed to put any weight on it. With his muscular dystrophy he isn’t able to balance crutches, so he will be in a wheel chair. After this left foot is healed, he will have the same surgery done on his right foot. That surgery is scheduled for March. We do not have any bedrooms on our first floor except the master bedroom so we set up a bed for Kevin in a corner of our living room. He is still asleep this morning so the pain level must not be too bad at this point. I imagine once the numbness wears off he will have more pain. Dr. Caird explained to us that with this kind of surgery the muscles are really stretched tight and most of the pain comes from muscle spasms and not from the incision. Son Joseph, 16, went along to the hospital for Kevin’s surgery. Joe and I were glad he did as not only did he keep Kevin from getting too depressed, he also helped get Kevin in and out of the van. Our Amish driver friend Beth took us at 4:00 a.m. for the two-and-a-half hour trip to the hospital. Kevin was Dr. Caird’s first surgery patient of the day so we had to be there early. Joseph doesn’t have a job right now but I am so glad for his help with Kevin here at home. I know he is eager to get back to work since helping me doesn’t earn money for him. He has saved me so many steps. With the girls’ handicap in going up and down the stairs, tasks such as bringing up dry laundry from the basement and taking the folded clothes up to the childrens’ bedrooms is hard for them. Joseph can do all the carrying up and down the steps for me and run other errands. In a few weeks I will have surgery so I will be laid up as well for a while. This will be a trial for me as I have a hard time following doctor’s orders but I need to be patient if I want to heal. Sunday, January 6, we hosted our Christmas gathering with my sisters Verena and Susan and Emma, Jacob and family. We were a total of 16 when the four of us sisters made the move to Michigan in 2004. We now have a total of 27 when we get together. This year instead of exchanging names we each brought a gift. We played Swap Bingo which went pretty well and everyone seemed happy with the gift they ended up with. After that I had wrapped a gift for everyone to open taking turns with big oven mitts. They had to throw dice until they had a “1” and then put on the oven mitts and try to tear the wrapping off to open the gift! Sometimes a person would not even have the mitts on when the next person grabbed the mitts. To their surprise though when they opened the first box there was another box wrapped and another so they had to unwrap until they saw the gift. Son-in-law Mose was the winner. The last box was especially hard to open since I used some wide clear tape to close the box. We also played Bingo until everyone had a small gift from Joe and me. Brunch was a haystack breakfast which consisted of biscuits, scrambled eggs, hash browns, meat (bacon, smokies, ham), tomatoes, green peppers, hot peppers, salsa, cheese sauce and all topped off with sausage gravy. Also fruit and dip and apple cinnamon cake, chocolate milk, white milk, orange juice, V-8 juice, and coffee. I had a turkey roasting in the oven to serve with all the snacks we had, before everyone left for home. We ate out in the heated pole barn as I have a kitchen area out there. This way the house stayed clean for our gathering Sunday morning. As always, we had fun spoiling Abigail, Jennifer, and baby Timothy. Sauté mushrooms and onions together in butter until tender. Combine 2/3 of mixture with water. Simmer 20 minutes. Sauté remaining mushroom and onion mixture with flour for several minutes. Slowly add milk and cook until thickened. Gently add to the simmering water mix and heat through. Cream of Mushroom Soup homemadeLovina's Amish KitchenThe Essential Amish Cookbook: Everyday Recipes from Farm and Pantry.